Fr. Mathew converses with a women suffering from Hansen’s Disease and her family, in his former mission in Maroua. Fr. 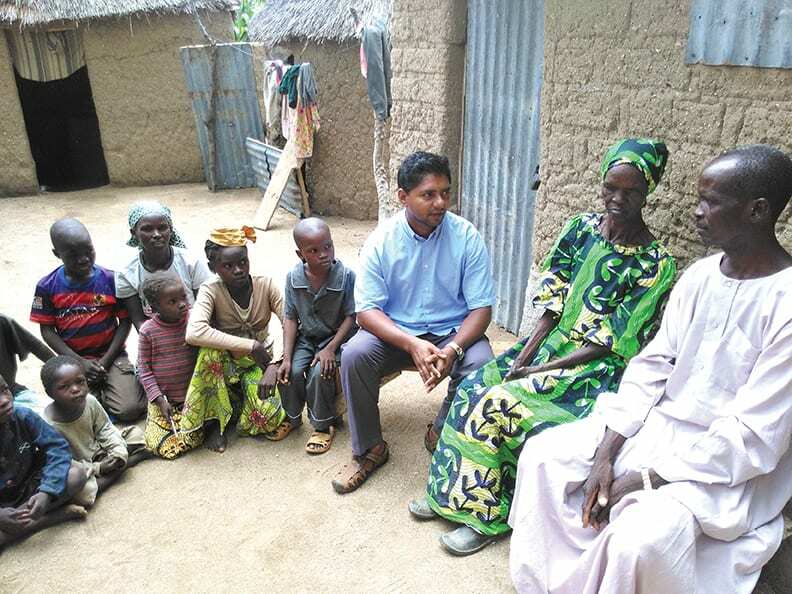 Mathew Kaniyamparambil, PIME, began his Missionary Priesthood assigned to the Far North of Cameroon; an area is known for its inhospitable nature. Two years ago he set out on a new mission, in the crowded slums of the capital of the country, Yaoundé. Although this new mission may be far from its adolescence it embodies “Mission” just as much as the isolated villages of the north, and it may just be more indicative of the future of mission on the African continent. A man walks through a silent crowd of onlookers. A macabre mask hides his face, his body adorned with paint and the heads of animals. The man is a sorcerer, the last vestiges of the pervasive, traditional mysticism of the ancient African religions that blend together on the continent. Traditions so rooted in the culture of much of life on the continent that it even impacts the understanding of other religions. It has its benefits, the African people, more specifically those from Cameroon; easily accept the mysteries of the Catholic Faith that you or I might struggle to grasp. However, its disadvantages often cost lives: innocent people often lose their lives at the cost of such superstitions, or worse, through deliberate sacrifice, a common problem in Mission areas that carry these kinds of traditions. Much like many PIME Missionaries in Cameroon, Fr. Mathew was sent to an area of the country that personifies the Mission ad gentes: the Far North Region. 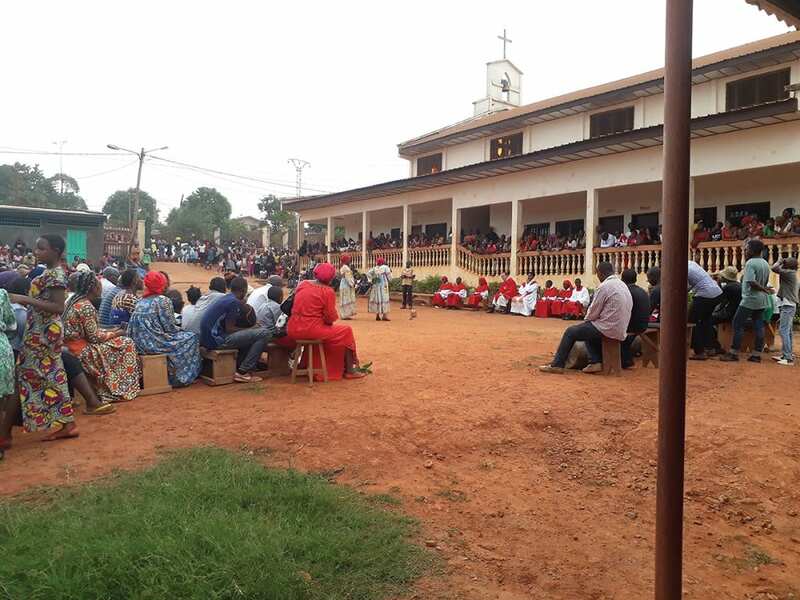 His assignment was the Diocese of Maroua-Mocolo in the extreme north of the country. Extreme in every sense of the word, this region is part of the Sahara Desert, and shares its borer with Nigeria and Chad, two countries that were, and still are, hotbeds for Boko Haram activity. in the slums of Yaoundé, the capital city of Cameroon. An already isolated and predominantly Muslim area of the country, sandstorms, harsh weather, and religious extremists are just a few of the things that make evangelization here particularly difficult. Fr. Mathew and his confreres would not be dissuaded from their mission to help the people here, as the challenges that presented themselves allowed for exercise of the full skillset required of the Missionary Priest: “I began my mission in a tiny Christian community in Meskine and in several desert-villages. Fr. Guiseppe Parietti and I lived in a Muslim village where most of our neighbors were Muslims,” Fr. Mathew details. “Fr Parietti was involved in Interreligious dialogue, seminary-teaching and translations. I focused my time on, visiting villages and missions, teaching catechism, formation of the youth etc. Eventually, I started to learn the local ethnic language called Fulfulde. 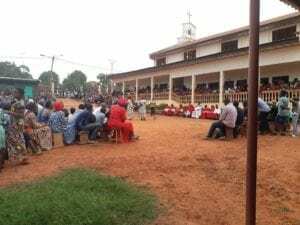 In 2016 we could open a primary school with 165 local children.” Although a difficult, and no doubt physically taxing, opportunity to stand witness to the charity of the Catholic faith, it was an opportunity nonetheless. Fr. Mathew reveals that he was even able to celebrate Mass with mothers who were imprisoned along with their children and those facing punishment due, in part, to their mental illnesses. 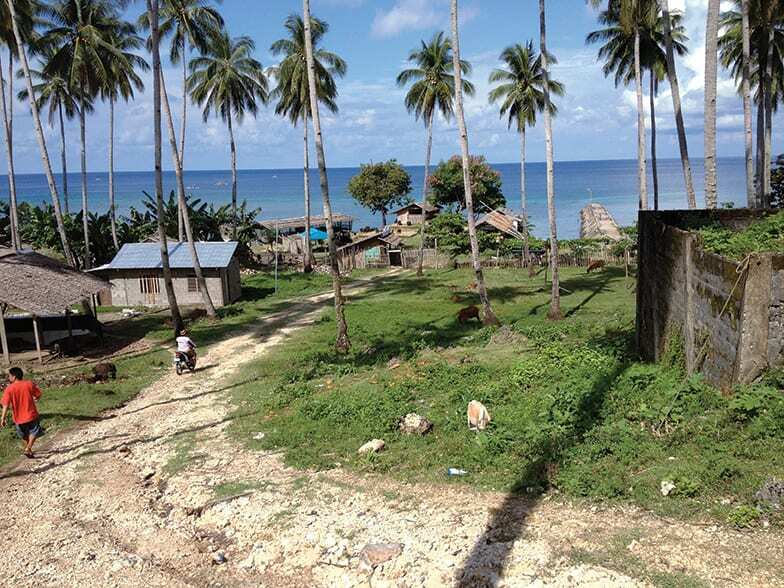 These extensive and trying circumstances allowed for the unique and personal form of witness that every PIME Missionary strives for in his mission. indirectly the future of the children here is in constant jeopardy. 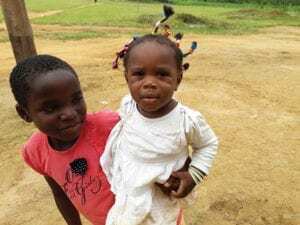 The pervasive violence in this, the heart of Africa, truly has left its mark on the hearts and minds of many seeking kindness and charity in this region, and Yaoundé is no different. Civil wars, Islamic State extremists, those who spill blood for resources or money, the public sees the refugees who make it to the far reaches of the continent and attempt to flee it. However, many more of these desperate people are internally displaced on the African continent itself, usually sacrificing the prospect of a future in exchange for their lives. In spite of all this darkness, Saint Blaise Parish means to stand as a beacon of light, the foundation of faith designed for those removed from the familiar, to start a new life. 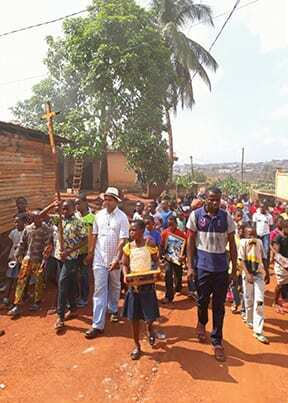 Although many problems are different here than those commonly associated with Cameroon, an urban mission in a country so constantly associated with isolation and distance from the “norm”, the problems of the rural traditions still hold a firm grasp on some, and so with more challenges come more opportunities. “The people here have a very strong sense of traditional practices and beliefs such as in secret societies, in witchcraft and sorcery, in spirits, in superstitions. They approach us with various experiences, which are real and true to them,” Fr. Mathew goes further, “for example, many come to me to help them from the disturbances of spirits, to interpret their dreams, asking the causes of hurdles in life.” Much like the Saint that the Parish takes its namesake from, people come from all around to seek healing; whether they are ailments of the body, the mind, or the spirit, they seek a new foundation to base the future upon, to base their lives upon. where he was recently appointed Pastor, Saint Blaise in Mvog-Ebanda. The growth of the community means the growth of the foundation, and the need for greater facilities to accomplish this work. This year, the missionaries here at Saint Blaise were able to complete construction on the presbytery of the parish to accommodate more priests, more refugees seeking shelter, and any other people displaced and seeking the asylum of the Church. 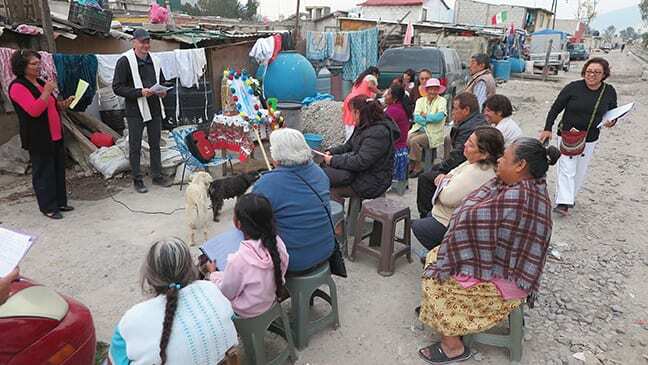 These desperate people needed a foundation, and they were able to complete these renovations thanks to the generosity of PIME supporters in the United States.